Horizon Nuclear Power announced on Thursday that it will suspend its UK nuclear development programme, following a decision taken by parent company Hitachi. 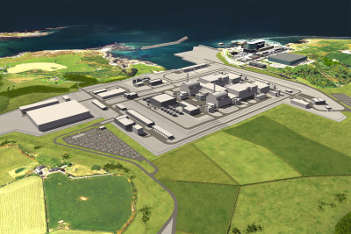 Horizon was developing the Wylfa Newydd nuclear plant on Anglesey in North Wales and has a second site at Oldbury on Severn in South Gloucestershire. The company said it has informed the Government of the decision ‘not to continue with the current programme of activities’, taken at the Hitachi Board meeting on 17 January. CEO Duncan Hawthorne said: ‘We have been in close discussions with the UK Government, in co-operation with the Government of Japan, on the financing and associated commercial arrangements for our project for some years now. 'I am very sorry to say that despite the best efforts of everyone involved we’ve not been able to reach an agreement to the satisfaction of all concerned. The move follows Toshiba’s cancellation in November of the planned Moorside nuclear power station in Cumbria. Justin Bowden, the GMB union’s national secretary for energy, said: ‘Hitachi’s announcement, coming so soon after the Moorside fiasco, raises the very real prospect of a UK energy crisis. 'As coal is taken out of the equation in the next few years and the existing nuclear fleet reaches the end of its natural life after 50 years, decisions are already long overdue for construction to be completed in time and not leave the country at risk of power cuts or reliant on imported electricity, much of it from unreliable regimes. Although Hitachi said it would write off its £2.1bn investment in the projects, Mr Hawthorne said he was confident that nuclear technology can play an important role in tackling the UK’s energy needs and meeting climate change targets.